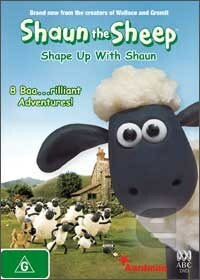 Shaun the Sheep (not to be mistaken for the Zombie spoof Shaun of the Dead) is actually a clay animated "family/children's" movie which stars Shaun from Wallace and Gromit's "A Close Shave". As with Wallace and Gromit, this series features a plethora of witty, entertaining and amusing characters which follows the exploits of Shaun who is not like the other sheep. Unlike his other kin, Shaun does not follow the rest of the flock which unfortunately for him, gets him into a wide variety of trouble. Fortunately for us, these anecdotes are extremely entertaining and will have children and adults alike in stitches. The animation of the show is amazing that will really make you appreciate the quality of this production. Presented in an aspect ratio of 16:9 with Dolby Digital 2.0 Stereo, this is a first quality show from start to finish.